Twitter users weighed in quickly and voluminously to Apple’s introduction of its new iOS 5 operating system. Reaction to the June 6 rollout accounted for nearly one-third (31%) of the news links from June 6-10, according to the New Media Index from the Pew Research Center’s Project for Excellence in Journalism. The day after the June 6 announcement, social media users were already downloading the upgrade, which had already been released for developers—and which includes more than 200 new features for the iPhone and iPad—by following steps to get a beta version of the upgrade before it was made public by using a backdoor. And they were providing followers with detailed reviews and commentary along the way. Their verdict was largely positive. “Day 2 with iOS 5 Beta: Impressed. New Music app rocks. iMessages are pretty flawless (albeit “jumpy”), Apple nailed Notification Center,” tweeted Arron Hirst, in what was a typical response to the new product. In the often technology-heavy Twitter conversation, no subject generates more consistent interest than the doings at digital media giant Apple. Couple that with a central function of acting as a kind of social media consumer reports for new tech products and gadgets, and this release was ready made for the Twitter entourage. 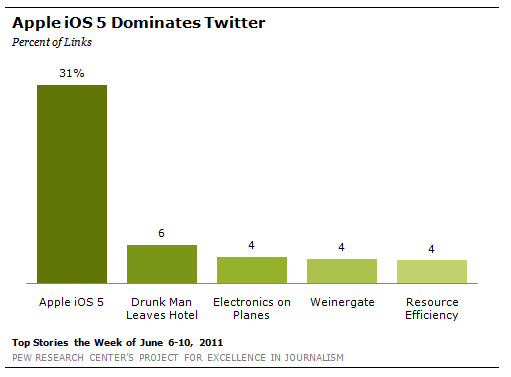 The rest of the top stories on Twitter last week did not come close to generating the attention of the iOS 5. No. 2, at 6% of the links, was a video of a drunk man stumbling around after leaving an awards show in London. That was followed by a story about how passengers’ electronics can, in fact, harm airplanes in flight (4%). Coming in 4th, was the fallout from Congressman Anthony Weiner’s June 6 admission of sending inappropriate photos and messages to a number of women. But at just 4% the story generated much less attention here than in the mainstream press last week. The No. 5 story was an article about innovation in resource efficiency, the concept of creating economic value out of a more creative use of natural resources (4%). Whenever Apple releases a new product, or even when there are simply rumors about a product, Twitter users get excited. And last week, the new iOS 5 operating system generated a lot of specific evaluations. “Surprise! Apple Has Also Built Social Contact Integration With Facebook, Flickr, LinkedIn and Myspace Into iOS 5,” said Liz Gannes. Many Mac and tech blogs wrote about the issue, also focusing on individual features of the update. “Apple to finally deliver 1080P video playback on iOS devices with iOS 5 http://goo.gl/fb/rKrjB #appleinc #iosdevices,” wrote 9to5mac, using the popular Twitter hash tags. “In iOS 5, The Weather App Is Location Aware http://bit.ly/lYvUaw,” wrote AppAdvice.com. “iOS 5 To Feature Nuance Voice Controls At Launch? http://goo.gl/fb/QiCGJ,” tweeted another blog, Geeky Gadgets. There were a few less-than-satisfied users. “The 7 Most-Wanted Features STILL Missing from iOS 5,” Alex Schleber tweeted, linking to an article listing the missing features. But others questioned why anyone would complain about the latest innovation. “why are people mad that iOS 5 is not compatible with 3G? that’s like being mad that Windows 7 doesn’t run on your pentium 1,” quipped Marc D’Amico. 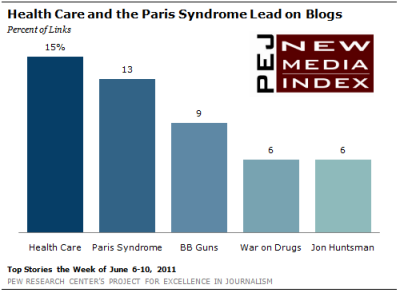 The discussions in the blogosphere last week focused on several hot button issues—including health care, guns, the drug war and the presidential campaign. The No. 1 subject, with 15% of news links was a story about how three federal judges in Atlanta posed skeptical questions during oral argument, suggesting they might be ready to declare all or part of the health care law unconstitutional. The large majority of bloggers who weighed in were pleased that the bill signed by President Obama was under legal challenge. The second-biggest subject (13%) was a BBC story about Japanese tourists getting “Paris syndrome”—becoming stressed when visiting the city because of rude Parisians or high expectations. It attracted attention last week when The Guardian revisited the topic and linked to the original BBC piece after noticing it was getting buzz on Twitter. The third-biggest story, with 9% of links, was an article about the police chief in Los Angeles urging the passage of a law requiring BB guns to be brightly colored to avoid confusion with firearms. That generated comments from gun-rights advocates who argued that criminals would paint regular firearms in bright colors. The No. 4 story (6%) was about how the war on drugs in Central America has not been very successful. That was closely followed (also at 6%) by news of likely GOP presidential hopeful Jon Huntsman choosing to bypass the Iowa caucuses. Conservative bloggers last week cheered the circuit court’s apparent skepticism about the constitutionality of the health care bill that was signed last year after a long and bitter political battle. “Granted, granted, a tough oral argument is no guarantee of defeat, but the mere possibility of O-Care crashing and burning in the 11th Circuit is tasty enough to be blogworthy,” wrote Republican Heritage. “I certainly hope they rule in favor of the Constitution, but the SCOTUS hasn’t always been so favorable to liberty. While I look forward to the day when the SCOTUS rules the entire law unconstitutional, I much prefer Congress completely repealing it,” wrote Chris Bounds at Liberty Juice. “…Things are looking up,” added MaxRedline. A number of bloggers jumped on the LAPD BB gun story, arguing that criminals would paint their guns in bright colors so that police would think they were BB guns. “If i were a violent criminal in LA, then I would paint my real gun to look like a colored toy or BB gun and that will cause the officer to delay that critical shot,” wrote M.J. Mollenhour at LuckyGunner.com. “Okay, so what happens when criminals start painting their real guns in bright neon colors?” wrote dcr Blogs. “Don’t worry criminals don’t know about Duracoat or Krylon,” said The Gun Guy Next Door. On YouTube, Sarah Palin and her much-publicized “One Nation” bus tour drew the most attention last week. The No. 1 and No. 5 videos focused on Palin’s June 2 stop at the Old North Church in Boston where she offered her own version of Paul Revere’s famous Midnight Ride. That statement, as was quickly pointed out in many quarters of the media, does not exactly fit with the historical record.